How do I approximate my assignment scores using the What-If Grades feature? As a student, you can view your grades based on What-If scores so that you know how grades will be affected by upcoming or resubmitted assignments. You can test scores for an assignment that already includes a score, or an assignment that has yet to be graded. 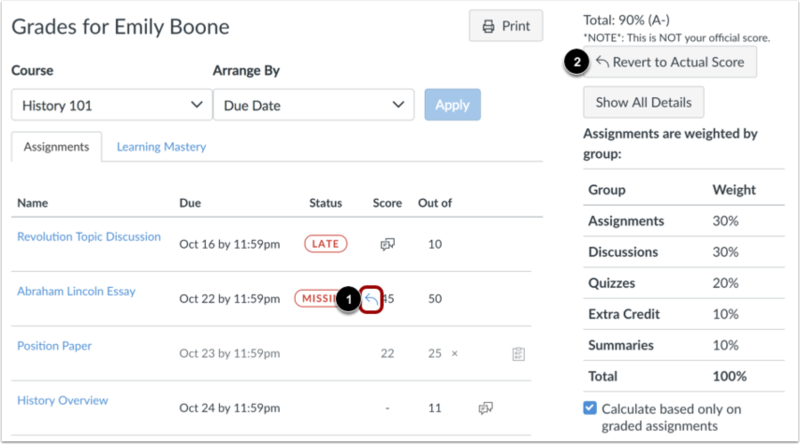 What-If scores simulate updates to your current and final grades. Depending on the grade calculation for your course, your grades may display as a point value or as a percentage. Your instructor may restrict you from viewing your current and/or final grades. View your existing grades to see how approximating scores will affect your grade. 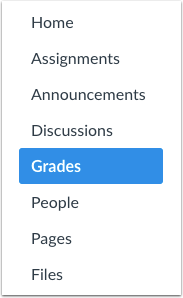 If available, your current grade is displayed in the sidebar . 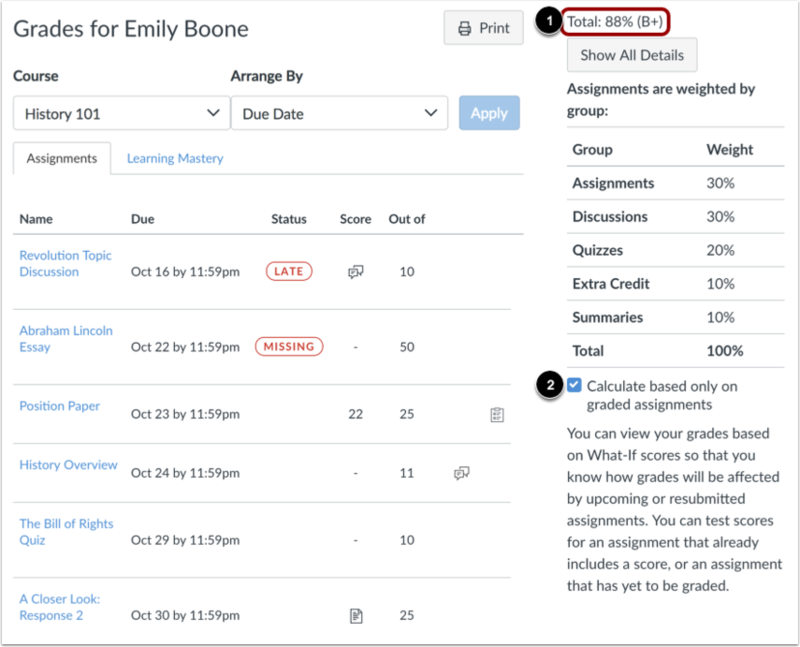 The current grade is calculated by adding up the graded assignments according to their weight in the course grading scheme and applies when the Calculate based only on graded assignments checkbox  is selected in the sidebar. This checkbox is selected in the sidebar by default. If you want to view your total grade, deselect the sidebar checkbox. Your grade will be calculated based on both graded and ungraded assignments. If your instructor is using grading periods, the grades page defaults to the current grading period. To change grading periods, click the Grading Period drop-down menu . Click the Apply button . Locate the assignment and click the score cell. Enter a hypothetical score for the assignment. The Grades page updates the total score with the What-If grade. To revert your What-If score to your actual score, click the arrow next to the What-If grade . You can also revert scores in the sidebar by clicking the Revert to Actual Score button . 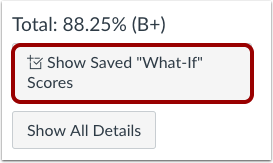 To view your grades using any What-If scores you've ever tested in your course, click the Show Saved What-If Scores button. Previous Topic:How do I use the icons and colors in the Grades page? Next Topic:How do I view my grades in a concluded course? Table of Contents > Grades > How do I approximate my assignment scores using the What-If Grades feature? Re: Way to see Projected Course Grade?